← Just What Are Garlic Scapes Anyway? My mother-in-law, without fail, would always set a huge clay bowl on the table at the holiday feasts filled to overflowing with speķa rauši. Except, they put them in the big bowl and set it on the table for folks to nosh on while the rest of dinner was put together. My husband and I were already there, having been shooed off to sit and not get in their way. So, we started digging in. I snagged a roll, saw it was a little rat and thought it was cute. I took a bite and wow! Pepper! But, you see, I love pepper. I’m quite happy having cracked peppercorn burgers and steak au poivre. To me, this little guy was spicy and delicious. So I asked if there were two types of speķa rauši today and both Mom and her friend went stiff. Turns out I had gotten the rat when I wasn’t supposed to as a guest. My father-in-law and husband both leaned over and whispered, “thank you!”, as they fluttered about apologizing profusely. Me, I loved it. Just wished they’d made more than two. Anyway. Speķa rauši is a yeast dough rolled out and cut into circles, topped with fried bacon and onions, sealed into a half-moon shape, brushed with egg wash and baked until golden brown and delicious. 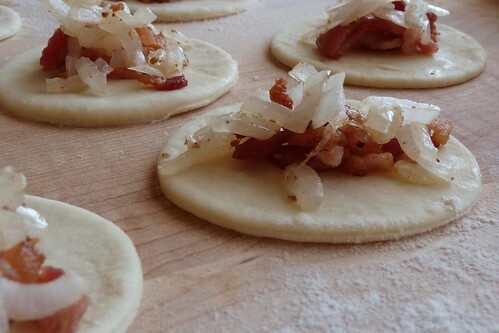 This recipe uses a common yeast dough and lots of bacon. It’s enough for a crowd, so if you just want to try it, make the dough, quarter it and freeze the rest. Six slices of bacon and half a medium onion will be enough for a quarter of the dough. Combine yeast with warm water and 1 tsp of sugar, stirring to dissolve, let sit for 10 minutes until doubled in volume. Mix in flour, half an egg, salt, butter and milk. Place in an oiled bowl on a rack over boiling/steaming water, cover loosely with a clean kitchen towel and let rise for 1.5 to 2 hours until doubled. Fry bacon until cooked but not crisp, remove to a bowl. Pour off most of the bacon fat, reserving about a two tablespoons. Cook onion in remaining fat until soft and beginning to turn brown on the edges. Remove to a bowl. Roll out the dough to about 1/4″ thickness for more crunchy rolls, thicker for puffier rolls. Using a biscuit cutter or a glass whose rim has been floured, cut out rounds. I use a 78mm (3 1/16″) cutter for traditionally sized rolls and a 68mm (2 5/8″) cutter for two-bite-sized rolls. Roll out the leftover dough again and cut out more rounds. Repeat if necessary. Place the rolls on a baking sheet lined with parchment, foil or non-stick liner and brush the tops with egg wash.
Bake at 350F for about 10 – 12 minutes. Check on them periodically, they’re done when the top has a dark brown patch and the roll is turning golden brown. Remove, allow to cool (they can cool in the serving bowl, no rack necessary) and enjoy. 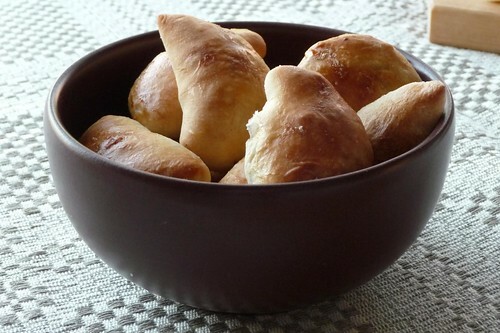 This is a basic yeast dough called for in many Latvian meals. Probably other cuisines too, but I’m not that familiar with common yeast recipes. Like Alton Brown, I prefer to use metric when baking. It’s just easier to measure by weight. This entry was posted in beef, ground meat, latvian, pork, recipes, side, snack, untranslated. Bookmark the permalink. Ah …. one of our all time favorites which I have always called pīrāgi. I just discovered that Facebook actually has a group dedicated to these Latvian masterpieces: http://www.facebook.com/piragi – how bizarre is that? I notice you (in common with my sister-in-law) fry off your bacon and onion. My mother didn’t do this and so I never have. I wonder what the rationale for your method is? Like you and my mother however, I used to role out the dough, cut out the rounds, re-roll, cut etc. etc. This, it seemed to me not only worked the dough too much but was tedious as well. Gunta taught me a different method. I place the risen dough on a work surface, pull out a sausage size ribbon and flatten with a rolling pin. 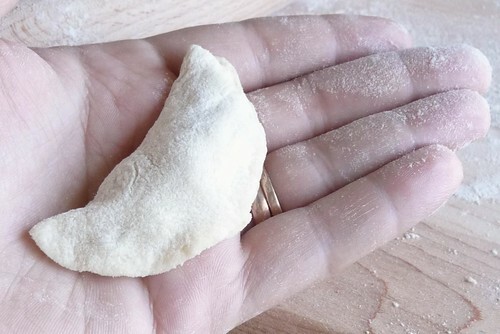 Put a pinch of filling near one edge, fold over some dough and cut around forming a half moon, sealing the edges in the process – this is sort of how we make ravioli. Move along the ribbon till you get to the main mass of dough, pull forward another ribbon etc. I don’t know if that makes sense but it sure works for me – I’ll have to take some photos next time. Your method of folding over and cutting sounds very similar to my method for making pelmeņi, actually. I never really thought about applying it to these, but I bet it is easier. The ribbon part doesn’t make too much sense, I wind up with this octopus-shaped dough ball attempting to take over the rolling pin (and thus the kitchen) in my head! Still, I like the fun of cutting out rounds if I’m making a small batch or have help in the kitchen — guess I didn’t have enough sugar cookies as a kid! A nice recpe idea you have here. I am always looking for more ideas to keep the kids entertained with and this one might just do the trick so thank you for sharing it. Pingback: The Kitchen Mouse » Merry Christmas! Priecīgus Ziemassvētkus!